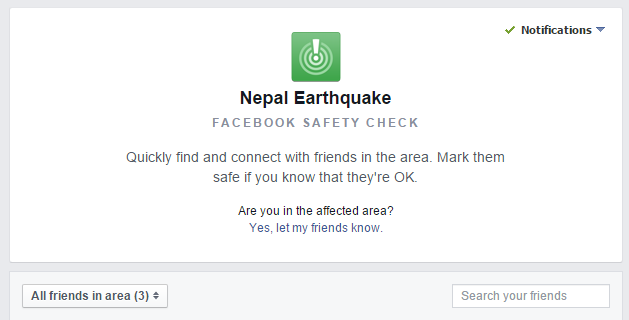 Facebook has just launched a safety check service for people affected by the great earthquake in Nepal. If you have family, friends and people who you know in Nepal, you should visit the Facebook page. If you already have a Facebook account, the page is accessible immediately at https://www.facebook.com/safetycheck/nepalearthquake. As I experience the great earthquake in Japan in 2011, I could not recommend this wonderful service more. In 2011, we experienced mobile network and internet crashed due to heavy traffic. I hope people in Nepal have an access to mobile network to use this service.